"City of 1000 temples", "Golden City of Temples". 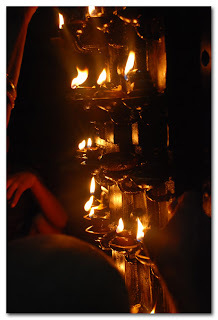 Kanchipuram has many names to its credit and is one of the oldest city in South India. It underwent many name changes, in ancient times it was called Kachi, Kachiampathi and Kanjivaram in different periods. This city of temple is ruled by many dynasty from Pallavas, Cholas, Vijaynagara & Mughals to British. Few temples are incarnated during Pallavas dynasty (3th-9th centuries) period and later extended or added during Cholas & VIjayanagara Dynasty. The city is revered as one of the seven sacred city in India and is in 2nd place next to Varanasi. The remains of Budhist stupas reminiscence the presence of Buddhism religion at that time. Jainism is also prevalent here. The majority of spoken language here is Tamil and Telugu. You might know the art of Shoulin Temple is preached by an Indian Buddhist Monk, the same monk was hailed from this city only. The presiding deity of this city is Goddess Kamakshi (Incarnation of Paravathi) & is one of the triad temple of Maa Shakti, the other being Madhurai Meenakshi & Kasi Visalakshi. The temple is situated in the heart of city and is surround by many other ancient temples near by. 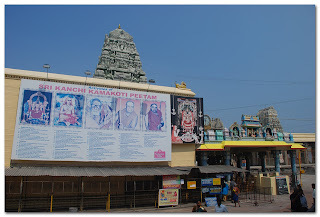 Its noteworthy that this famous temple is not the original temple of Kamakshi. The acutal one is near to this and is called Adi Peeta Parameswari, though I missed to visit this. Its also noteworthy that the present temple was once a Jain Tara temple until 12th century after which it was gradually converted to Shakti temple. 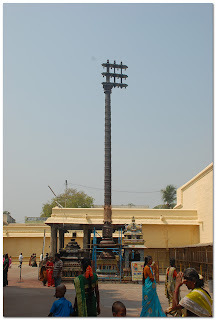 The famous Sri Chakara which is installed in this temple is not the actual one installed by Adi Shankaracharya (Great Hindu Saint and disciple of Goddess Shakti) but in the original temple i.e. Adi Peeta Prameswari. There are few inscription which clearly shows that this was once a Jain temple. There isn't any entrance fee and camera can be carried inside the temple but not allowed to take snap of the sanctum. The deity is in sitting posture and can be seen within 7-8 feet distance. Since we went on Sunday so didn't faced any major rush. The gopuram of sanctum sanctorum is gold plated. The whole temple is fortified with stone wall. 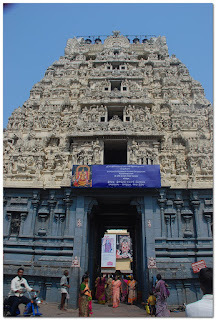 Each side has a gate having a temple like structure built as a gate way (common in almost all South Indian temples). In the pic below the guru (third from the left) is believed to have attained Shakti's (Amman) divine darshan and he himself had talked to her. The pond is on the back side of the temple a common for all temples, not maintained at all and looks like it gets its share of fresh water only through rains. 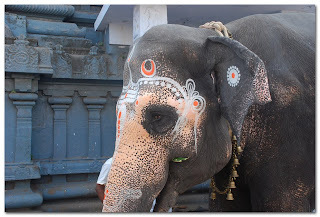 Saw one old elephant in the entrance gate beautifully marked on his forehead and standing helplessly. I suggest its better to feed fruits etc then to give money, by giving fruits at least you know that you fed. 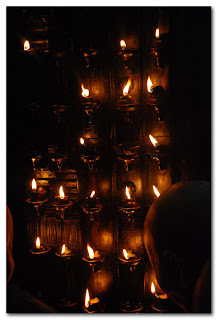 After visiting Kamakshi Temple we headed for Vishnu temple which is in the other end of the city, area which is commonly called as Chinna Kanchi (little Kanchi) where most of the Vishnu temples are erected and other side where Shiva temples are is called Shiva Kanchipuram. The very importance of this temple is that it is one of the 108 Divya Desams. There are 108 Vishnu temples which are considered as Divya Desam's, 105 are in India, 1 in Nepal and 2 is not on this earth. There are total 18 Divya desams in Kanchi itself and all are very ancient built at the time of 9th-13th century during Pallava Dynasty. There are three Idols incarnated here, Life size idol of Lord Vishnu is in the upper portion of the main temple where ground level is occupied by Lord Narismha and on to the right resides Goddess Tyaar (incarnation of Goddess Laxmi). It is few km far from Kamakshi temple at the end of the city. Currently the Temple Gopuram is undergoing some structural reforms or cleaning. This is said to be the biggest in area in Kanchipuram. Few architecture like 100 pillar (actual 96) mandapum is built during Vijayanager Dynasty. Each pillar is exquisitely sculpted depicting the pillars in various forms mainly a horse rider with each sculpture differing with other. Now housed as a ticket counter. The burning heat has stopped me shooting the pillars in close that to with bare foot. It was an extremely hot weather and to walk bare foot from the gate to the temple sanctum was a bit burning attempt. The temple authoritative should have at least laid out some shed upto the main door instead they just put series of rubber pathway on one side. They charge Rs 5 for still camera. This meticulously sculpted stones can be very well compared with the one found in warangal fort (I yet to find sculptures which is more aesthetic this these ones) but sure it is worth seeing. This temple also host Anna Daanum (free lunch just near the entrance gate) but then its only applicable for devotees who visits this temple. Beggars of the city were not allowed to enter the premises. This raises one question which I even asked the security gaurd i.e. "Whats the use of giving free lunch to those who themselves are capable to buy out?" obviously he can't answer this and I didn't donated anything towards the free "Anna Daanum" (they have Hundi's at few places for collecting money towards this free lunch).They charge entrance fee of Rs 5 if you visit temple between 12-12:30 pm, rest of the time its free. The prasadam are available just opposite to the 100 pillar structure, not free though. This is Shiva temple and is situated near Kamakshi Amman temple. 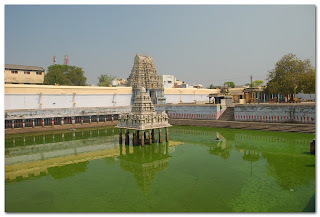 This is the very place where Goddess Paravathi worshipped/performed tapas to marry Lord Shiva. During her tapas she built a Shiva Lingum out of sand which is still there in the temple sanctum covered by metal/or glass shield (the same way we have in Rameswaram). On the back side of the sanctum sanctorum is the Mango tree under which Goddess Paravathi has performed her penance. This mango tree is believed to produce 4 different taste of mango out of its four different branches and is said to be 3500 years old (the old one which died already 3-4 years back). The temple was built by Pallavas and later contributed by Chola Dynasty. Sanctum is not big and has special darshan provision for Rs 5 (its nothing special, general public enters through left side door and this by front door in general both will be standing facing each other, temple authoritative are just making money out of this). The Lingam (shield) can be clearly seen even from the entrance far outside where Nandi Idol is erected (if its not that much rush). Another noteworthy fact of this temple is it has 1008 Shiva Lingam built along the inner wall of the temple. Not all in same shape & size. 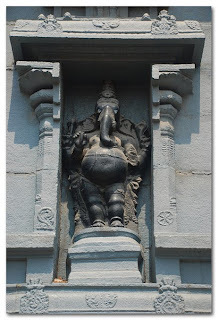 There are four Idols in each corner of the temple (inside just outside the sanctum sanctorum) Ganesha, Vishu & Shiva (i forget the fourth one). The Shiva Idol (Lingum) in one corner has a special feature i.e. it is the biggest Lingam in the Kanchipuram (well it is much smaller then what you will see in Warangal) but what set this apart is it has 1000 small miniature Lingam engraved on the main Lingam and also believed that Sri Rama has worshiped here. (There are total 3 places where Lord Rama offered worship to Lord Shiva) 1. Rameshwaram 2. Kanchipuram 3. Kaasi. True or not but the Lingam appearance is breathtaking as i haven't seen such structure any where. The exteriors surrounding sanctum is quit intricate and looks like almost new as seen in the pic its only these exteriors which are meticulously carved rest of the outer temple structures are rather plain. There are quit long corridors supported by pillars on both side and series of Lingam running along the wall. All the temples are closed between 12 - 4pm daily. And surely need more then one day if you wanted to cover other temples (remember it has around 1000 temples).What I have stated here is just a tip of an ice burg as this city holds many many more historical facts and events. Every Vishnu followers aspire to cover all the 108 Divya Desams in his life time 106 in this life and 2 after life (in heaven). I just visited 2 of them (Tirupathi and this one). Its the hot weather which dithered me to cover rest of the 17 temples (there are 18 Divya Desam in Kanchi alone) but then I am still alive so will try to cover them in future. Apart from temple Kanchi is famous for one more thing, the same which Mysore is famous for yes it is Silk Sarees. It's a hub of hand woven silk sarees in Tamil Nadu which may range from few thousands to lakhs in cost. During our 12-4pm break we visited one store in Gandhi Rd called Pachayappan (one thing I liked about this store is the price is fixed, I usually hate bargaining as I am weak on that). The owner also runs school and college by the same name. thank you for the very useful info. Actually i am planning to visit few places in tamil nadu with my parents. My mom wants to visit Rameswaram. We are planning to goto places like rameswaram,kanyakumari, maduri, trichy, kanchipuram. your information will be veryful for me when we visit kanchi. I am planning to go there in next few days and you just make my trip easy and I found very useful information here. Thanks for that. keep regular visit then get more info..
Travel and Life | Travel Blogs | blog share - Unshakld,thanks for sharing.